Preface: Production helium leak testing of small sealed devices such as electronic components can be challenging. Often, small sealed electronics and other hermetically sealed devices require fine leak testing to ensure seal integrity. A leak rate sensitivity in the range of 10-5 to 10-8 atmcc/sec is very common for product performance which demands that helium leak testing be used versus alternative tracer gases and methods. When helium leak testing these small sealed parts, helium must be introduced somehow, into the part in order to perform the leak test. This can be done during the assembly process or after assembly by a technique known as helium bombing. A bombing chamber can be used to inject helium into small, sealed devices in preparation for helium leak testing. The bombing method is commonly used when it is impractical to inject the helium tracer gas into the part during assembly. • Time parts are exposed to 99-100% helium under pressure. • Helium bombing pressure used in the chamber to bomb parts. Typically, 30-60 psig. • Maximum allowable time after bombing before leak testing is required. • A bombing chamber is a tool used to inject helium into small, sealed devices in preparation for helium leak testing. Traditional hard vacuum test methods use a small vacuum chamber to leak test these devices. Once the part has been assembled with an internal helium atmosphere, or assembled then bombed with helium, they can be placed either individually or in batches in the leak test vacuum chamber. If tested in batches and a leak is indicated on the leak detector, the batch can be divided into halves until the leaking device(s) is identified. One challenge of helium leak testing small devices is that the amount of helium inside the device is often very small and is finite. For this reason, caution should be taken when considering retesting the parts, as helium can ultimately deplete from parts with gross and medium-sized leaks. Additionally, if a gross leak is present, it is possible that during the pump-down cycle most of the helium is depleted from the inside of the leaking part. In this case the part could pass the leak test because insufficient helium remains. Special test methods can be developed to minimize and even eliminate this effect. If the design of the leak test system does not account for detecting gross leaks, then pre-testing of the parts using a gross leak test method is recommended. It is common for small sealed electronic devices to be bombed (i.e. injected) with helium prior to leak testing as a way of introducing helium into the part. 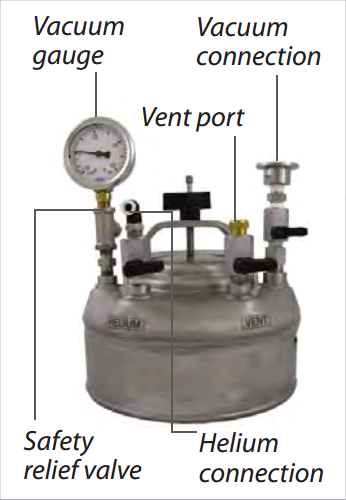 The bombing equipment must allow for control of helium pressure, bombing time, and proper evacuation and venting of the helium. Devices with larger internal volumes will require higher bombing pressures and longer bombing times in order to introduce sufficient helium. In some cases parts with relatively large internal volumes cannot practically be bombed and must be filled with helium during the assembly/sealing process. It is important to understand that in helium bombing it is difficult to predict how much helium will be actually introduced into the part. For this reason it is often desirable to run a series of validation tests using the bombing parameters to insure the desired results are obtained. In some cases a “fixed” test method is used that gives the user a set of predetermined bombing conditions in a tabular form. Helium bombing is normally performed in batches. After bombing, the parts should be sprayed off with air or nitrogen to remove surface absorbed helium. Additionally, the maximum time between bombing and testing (dwell time) should not be exceeded in order to insure that helium does not deplete from a leaking part while waiting to be leak tested. Normally helium bombing should be performed in a separate location from leak testing. This will minimize helium contamination of the area near the leak test station. Helium leak testing of small electronic devices is an effective and reliable test method. Proper design of the method of introducing the helium into the part, whether bombing or pre-filling, is critical for a successful test. Care should be taken to prevent helium depletion from gross leaking parts that may result in the part passing the leak test. • Turn-key, automated hard vacuum leak testing, including proprietary “one-step” test methods that eliminate potential helium depletion of sealed components. • Turn-key, automated https://www.lacotech.com/c/leak-testing/leak-testing-accessories/helium-bombing-chambershelium bombing systems. • Helium bombing chambers and accessories.